I mentioned in my anniversary post that I was entered in a bacon cook-off. Well, sometimes you have to know when to cede to greatness, and when I tasted Roland’s bacon pierogies last week I knew that he should take my place. I was happy to be a guinea pig and to help in perfecting and plating the pierogies. Roland’s creation was a response to his girlfriend’s pregnancy craving for loaded-potato-skin-pierogies but he succeeded in making something that is much more widely crave-able. You don’t have to be pregnant to be left wanting more and for those of you who do, I hope to be able to share the recipe here with you soon. Bacon Camp is a national phenomenon started early this year and it is springing up all over the country. The first Bacon Camp Columbus was a great success with over 150 people in the audience, countless helpers and over 20 participants. 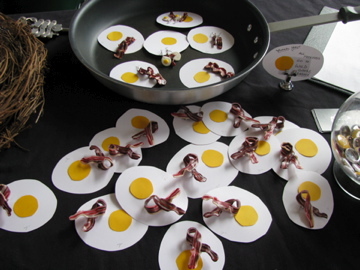 It was held at Wild Goose Creative, who showed us that bacon is not just an art form but a great way of bringing the community together. By the end everyone had greasy fingers and a smile on their face. Bacon Camp was a celebration of all things bacon and there was everything from bacon soap to ice cream scoops, dental floss and jewelry. Unsurprisingly the thing to wear was a bacon inspired t-shirt. 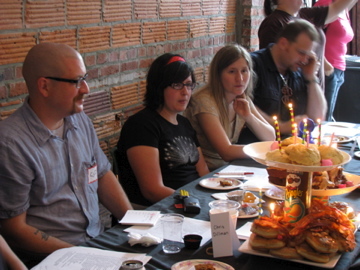 The six intrepid judges tasted and scored all 17 bacon food items and also judged the bacon art competition. The bacon birthday cake below could have been entered in both the art and the food category, it was truly a feat of engineering. There were no bacon explosions but a wide variety of foods from sweet (ice cream, apple pie, cakes and cookies) to savory (sauerkraut, mustard, beans and soup). There were a number of strong contenders in the ‘most likely to cause a heart attack’ category, including the deep fried bacon and the donuts fried in bacon grease! 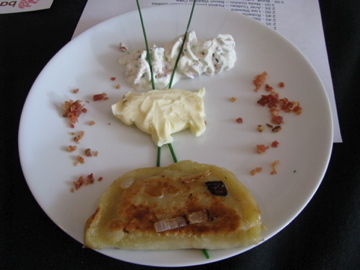 There are photos of almost all the food entries on flickr, but here are the prize winning pierogies, served with bacon and chive sour cream and a butter pig. As I said, I knew that Roland’s pierogies were good and I was delighted when he won, not only the people’s choice award but the Judges’ first place too. This is quite an achievement for someone whose signature dish a year ago was Kraft Mac and Cheese and it was the result of a lot of hard work, research and trial runs. 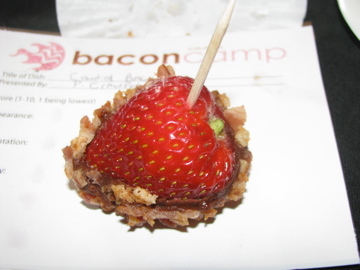 The other winning food items were a double bacon taco and a strawberry dipped in spicy chocolate and bacon. There were less entries in the bacon art category, but some fantastic creativity with a bacon scarf (made of wool), bacon roses (made of bacon) and a paper mache bacon pig in homage to Michael Jackson. 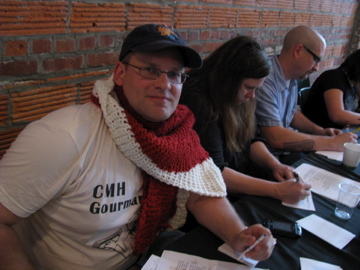 CMH Gourmand models the bacon scarf, which had to be wrestled away from him later. CMH Gourmand was one of the judges and not only survived eating all 17 bacon food entries, but was persuaded to come for a bacon wrapped Mexican hot dog afterwards. His love of bacon and the pursuit of taco trucks know no limits. As for Roland, we are just waiting to see what the next pregnancy craving will be….. pickle pierogies anyone? 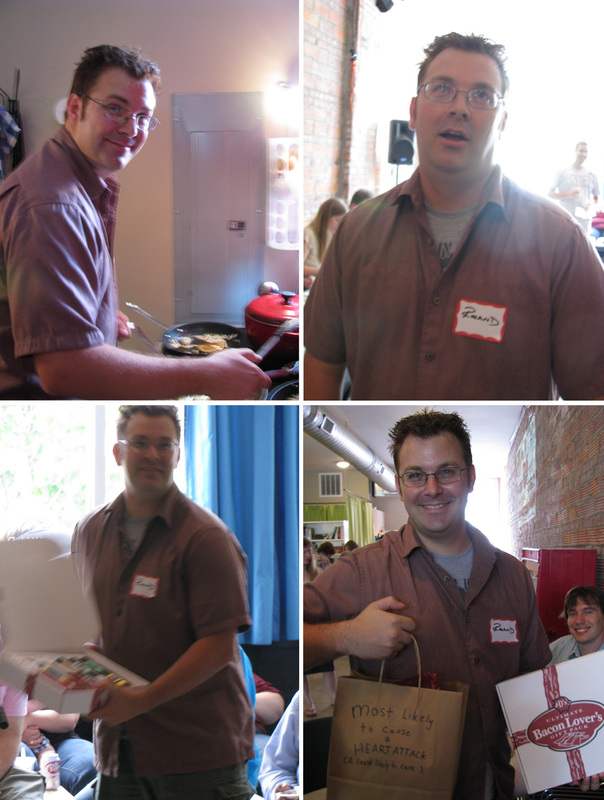 More photos of the event and CMH Gourmand Post. 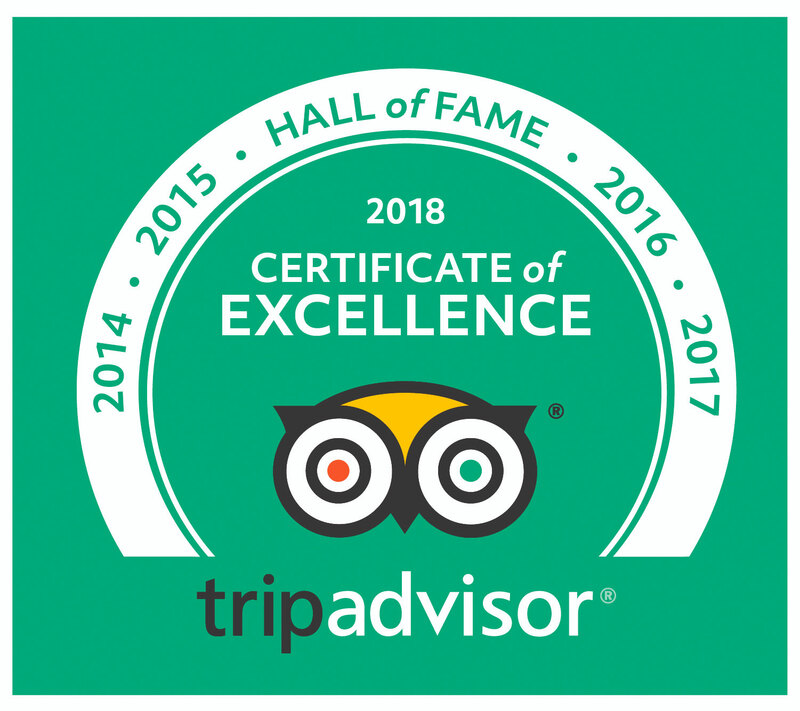 Hi Hungrywoolf, great review! I’d love to post some of your pics and a link to your review over at Skulls & Bacon. Would that be ok? Hi Hungrywoolf! 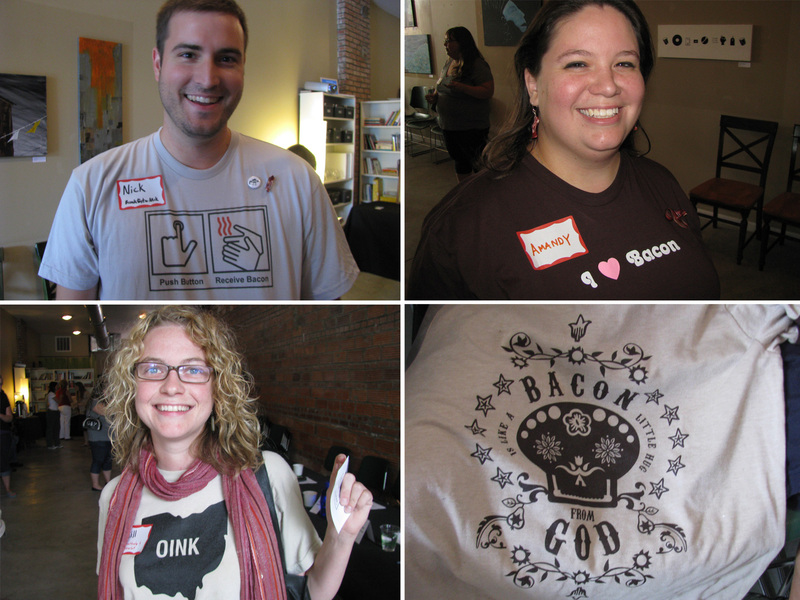 Just curious, might you be able to put me in touch with those that organized the BaconCamp event here in Columbus? Coincidentally, my partner in crime and I have something brewing for 2010. Check it out at http://www.ba-con.org, or follow us on Twitter @ohio_bacon. 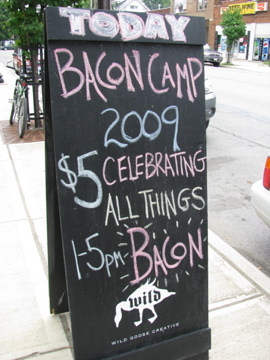 I can’t believe I missed BaconCamp!